The Music Department at Allen-Stevenson uses an eclectic approach to music education that keeps in mind the differing levels, abilities, and learning styles of the students. While fostering personal growth in music, we also stress the boys' ability to work, play and create together. Practical experience is emphasized in the classroom through the playing of instruments, singing and musical games. The ability to sing accurately with a clear tone, to interpret pitch and rhythmic notations, and to participate in group ensembles are three primary goals that are outlined in our curriculum. In addition to classroom music, Middle School boys (grades Four through Six) are eligible to participate in the Orchestra and Chorus, with enrollment by audition. Membership in either the Chorus or Orchestra gives boys at Allen-Stevenson a sense of purpose in music within the school. The performing ensembles are featured every year in December and again in May. The opportunity to perform for neighboring schools and charitable organizations such as nursing homes or hospitals contributes to the sense of collective identity which members of these ensembles share. In addition to classroom music, Chorus, and Orchestra, music in the Middle and Upper School is offered as an elective. A high point and a popular tradition at Allen-Stevenson is the annual Gilbert & Sullivan performance that concludes the winter term. Through Gilbert & Sullivan, boys in the Upper School, Middle School, parents and faculty have a rare opportunity to work together to stage a major performance. These musical events represent high points within the music program, bringing together teachers and students of the Middle and Upper Schools. From Carnegie Hall to the White House, beautiful ensemble singing...Since 1990, Allen-Stevenson Choruses have established themselves as first-rate choral ensembles, performing at the White House, the Kennedy Center, Carnegie Hall and for many organizations throughout New York City. Recent professional engagements include a performance of the St. Nicolas Cantata by Benjamin Britten and Carl Orff’s Carmina Burana, both with the Musica Viva Chorus of New York City. The two Choruses include boys in the Fourth through Sixth Grade and Seventh through Ninth Grade, and stand alongside the Allen-Stevenson Orchestra as a testimony to the School's commitment to music and art. Allen-Stevenson has been a forerunner of instrumental programs nationwide for the last 65 years. 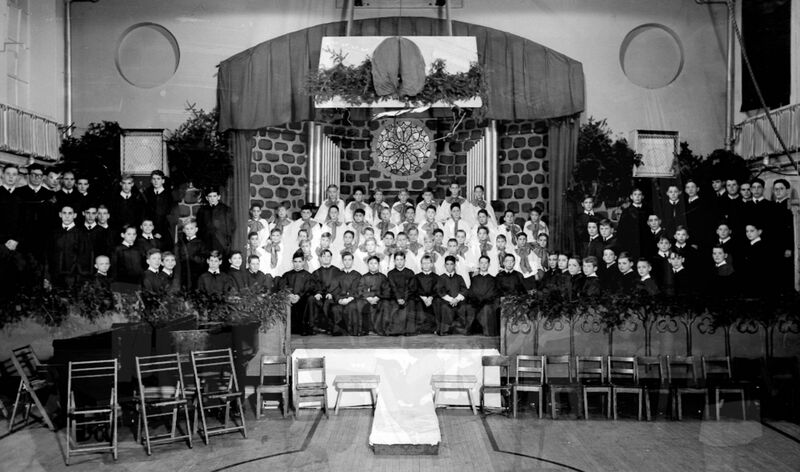 As an independent school, it was the first to host its own orchestra (before the InterSchool Orchestras of New York originated to help New York schools develop programs). It developed into an outstanding program that hosts 13 professional concert musicians who train boys for four different orchestras within the School now, as well as prepare boys for New York State School Music Association, music conservatory auditions and competitions in some cases.The orchestra in its mission of music has performed at many independent schools, including The Brearley School, The Chapin School, The Nightingale-Bamford School, Collegiate School, Princeton Friends School, Elisabeth Morrow School, The Albany Academy, Indian Mountain School, Moses Brown School and Greenwich Country Day School. The trips always combine education with recreation. The A-S Orchestra recorded on National TV in the '70s with Jerry Lucas, performed at the White House in the 1980s, inspired and facilitated by the Bush family at that time and recognized by Ronald Reagan. More recently the Orchestra has performed in two Middle School Orchestra festivals at Carnegie Hall and Lincoln Center, with a very special all-school concert at Alice Tully Hall showcasing the Upper School Orchestra and Chorus with the entire school community transported to the event. The senior orchestra also travels and performs in the North East. Past trips have also included Princeton, Yale University, Philadelphia, and Mystic, Connecticut. Students in Grades Two through Five are invited to try out and be tested on the orchestral instruments during their music classes. Parents may choose to enroll their sons in private lessons at Allen-Stevenson. Instrumental Instructors are employed by the School, and lessons are scheduled during a student’s school day, on a rotational basis throughout their academic schedule. Music develops responsibility, self-discipline, self-confidence, self-esteem, a sense of accomplishment, social skills, and the ability to work with others…and it’s fun!